Fair Game tells a story that should be fantastic and unbelievable, except for the fact that it is apparently true and paints a grotesque picture of the extent of corruption and the powers of red tape in the United States. Valerie (Naomi Watts) is a CIA undercover operative up to her ears in post 9/11 investigations and follow ups designed to make sure nothing of that magnitude can ever happen again. Valerie is dogged, determined and especially capable, not even sharing information with her husband and family at home. One day Valerie is asked if Joe (Sean Penn) is qualified and connected enough to perform a follow up investigation in the heart of Africa. ‘Sure is’ says Valerie, and Joe heads off to Africa to work on his report. I should mention that Joe and Valerie are husband and wife. Meanwhile, reports come in to the CIA that ‘expert opinions’ state that the Iraqis are ‘probably’ developing weapons of mass destruction (WMD’s) and that aluminium tubes are ‘quite similar’ to those that are capable of containing extremely combustible uranium. With that many inverted quotations these claims need to be verified, and Valerie and many others are put on the case, with Valerie globe hopping to query, question and straight up interrogate several foreigners in search of the truth. With a couple of globe hopping spouses the Wilson household was already a tense place to live, especially when one partner is apt to depart for an unknown destination with no return date or information about the journey. When Valerie’s travels become more frequent and obviously more dangerous Joe grows ever more touchy. When dinner party conversation veers political Valerie plays dumb despite knowing more than almost anyone else. Joe on the other hand has no such ‘mute’ button and quells any misinformed argument Bill Maher style with abrupt and direct force. This is news to Joe and Valerie who know full well that Joe’s report was in the negative. Val toes the company line and maintains as the loyal soldier, Joe however… well I just told you about Joe. Fair Game is intercut with real media snippets including leading political figures of the time, all spouting information that has since been disproven publicly. Your view on the success of this film will also be distorted by how you feel about the purity of the ‘facts’ on show, after all the film was based upon books written by Joe and Valerie Wilson in the years following the ordeal, and they felt that it was faithful enough to their versions of events to perform a dual DVD commentary on the film. 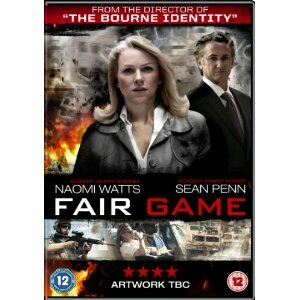 But regardless of the rose tinted view of events that this may or may not portray, Fair Game is an effective drama, well acted by Watts and Penn, and still another warning about the power and deviousness of politicians and big business. Final Rating – 7 / 10. If the movies are to be believed there really might not be an honest incorruptible person in the United States – at least no-one who doesn’t do their own DVD commentaries.